For thousands of years, farmers used flavor to drive their planting decisions. After all, flavor also meant nutrition and adaptability. A flavorful and diverse farm meant resilience during unpredictable weather. But as pressures mount on farmers to plant for scale and to grow for cross-country shipping, flavor often gets left behind. We end up with crops exactly the same size and color that ripen in grocery store aisles with the help of chemicals. This monocrop economy, driven by large corporations, doesn’t leave room for diversity or flavor. Our farms are more vulnerable to climate change. And our plates suffer from bland food. Slow Food believes biodiversity is key to a sustainable, adaptable — and delicious — future. That’s why we are launching the Plant a Seed campaign. We want to give you the tools to get amazing flavor back on your plate. We’re leaning into our theme this year, Where Tradition Meets Innovation, and pairing seeds from the Ark of Taste, our library of delicious heritage foods facing extinction, with Row 7 Seed Company, an innovative company co-created by chef Dan Barber and vegetable breeder Michael Mazourek devoted to breeding new plants for flavor. 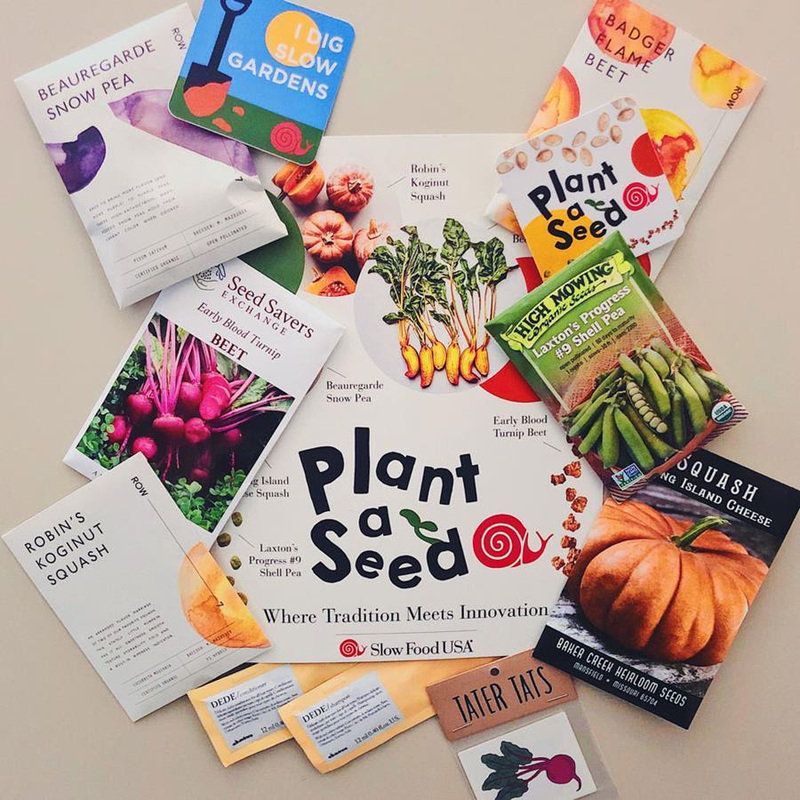 The national Plant a Seed kit features six seed packets: three from the Ark of Taste and three from Row 7. We had three criteria: 1) Not fussy and adaptable to many growing regions, 2) Fun to grow and harvest, 3) Delicious. Ark of Taste: The Long Island Cheese Squash is versatile and delicious. It can be used for sweet pie fillings, roasted and served with other winter vegetables, and even used to make pumpkin beer. Row 7: Robin’s Koginut Squash is stately little pumpkin that offers sweetness, smooth texture, storability, yield and a built-in ripeness indicator to ensure it’s picked for peak flavor. Ark of Taste: Laxton’s Progress #9 grows small but produces large pods with up to nine sweet and delicious peas per pod. Row 7: Bred to bring more flavor (and more purple) to purple peas, the Beauregarde Snow Pea features high-anthocyanin, wavy-podded snow peas that hold their vibrant color when cooked. Ark of Taste: One of the oldest surviving varieties of table beet, the Early Blood Turnip Beet has dark, violet-red flesh and remains flavorful, tender and juicy even when large. With its clove-like aroma, it tastes of cinnamon with a hint of heat, followed by a tartness and a rich earthy finish. Row 7: The flame-colored Badger Flame Beet is sweet enough to eat raw and deliberately lacking in beets’ signature earthiness. Shampoo + conditioner samples from biodiversity-driven haircare brand Davines. Their essential haircare contributes to the protection of biodiversity – and to the support of small-scale farms – through the use of ingredients from Slow Food Presidia farms in Italy. It’s all packed up with love from our Brooklyn office in a sweet tote from Davines.